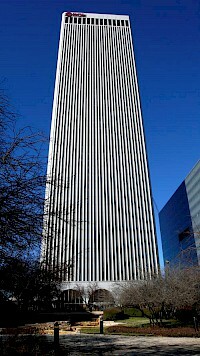 1801 California Street, also known as Qwest Tower, is a skyscraper in Denver, Colorado. The building was completed in 1983, and rises 52 floors and 709 feet (216 m) in height. The building stands as the second-tallest building in Denver and Colorado, and as the 111th-tallest building in the United States. 1801 California Street was previously occupied by offices for US West, but now serves as the world headquarters of Qwest Communications. 712 5th Avenue is a 650ft (198m) tall skyscraper in New York City, New York. It was constructed from 1990 to 1991. It is the 53rd tallest building in New York City. 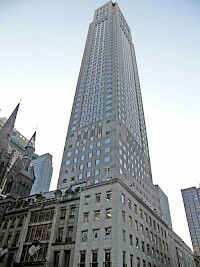 The towers design had to accommodate the landmarked façades of the Coty and Rizzoli buildings at the base of the tower. The 777 Tower (also called the Pelli Tower) is a 725 feet (221 m) tall, 52-story office building designed by César Pelli and located in downtown Los Angeles, California. Developed in 1991 by South Figueroa Plaza Associates, the building contains approximately 1,025,000 square feet (120,773 m) and a three-story Italian marble lobby. The exterior is clad with sculpted white metal and glass. The tower is adjacent to the 7+Fig Shopping Center and currently owned by Maguire Properties. 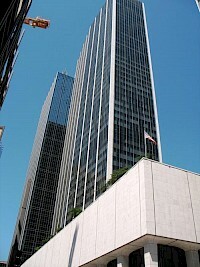 555 California Street, formerly Bank of America Center, is a 52-story, 779 ft (237.4 m) skyscraper in San Francisco, California. It is the second tallest building in the city and a focal point of the Financial District. Completed in 1969, the tower served as the world headquarters of Bank of America until the 1998 merger with NationsBank, when company moved its headquarters to Charlotte, North Carolina. BOK Tower, formerly One Williams Center, is a skyscraper in downtown Tulsa, Oklahoma. At 203 m (667 ft) in height, the 52-story tower is the tallest building in any of the five "Plains States": Oklahoma, Kansas, Nebraska, North Dakota, and South Dakota, as well as the surrounding states of Missouri, Arkansas and New Mexico. It was built in 1975 and designed by Minoru Yamasaki & Associates, the same architect who designed the World Trade Center in New York. City National Plaza is a twin tower high-rise complex located in downtown Los Angeles, California, United States. The complex includes two towers: City National Tower and Paul Hastings Tower. The towers held the crown of tallest buildings in Los Angeles for one year before being overtaken by the Aon Center. City National Plaza is located on the site of the Art Deco Richfield Tower, designed by Morgan-Walls and Stiles O. Clements in the 1920s. 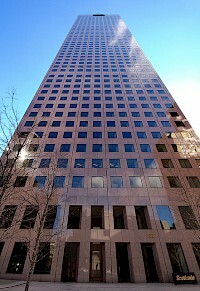 Elm Place, formerly First National Bank Tower, is a skyscraper located in the Main Street District of downtown Dallas, Texas (USA) and adjacent to DART's Akard Station. The high-rise is 625 feet (191 m) and 52 stories tall, making it the tenth tallest building in Dallas. In January 2010 the building was closed due to low occupancy rates. The $35 million skyscraper was designed for the First National Bank of Dallas by architects George Dahl and Thomas E.
Four Seasons Hotel New York is the flagship hotel in the Four Seasons Hotels and Resorts chain. In the 1980s, William Zeckendorf, a prominent American real estate developer, assembled 25,000 square feet (2,300 m) of vacant property on 57th Street between Madison and Park Avenue. Robert H. Burns, founder of Regent International Hotels, approached Harunori Takahashi, owner of EIE International Corporation company to build a luxurious hotel on the property. 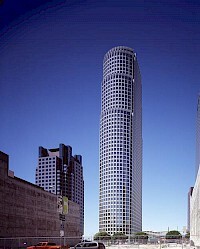 The Gas Company Tower is a skyscraper in Downtown Los Angeles, California. It serves as the headquarters for the Southern California Gas Company, which vacated its previous offices on Eighth and Flower Streets in Los Angeles in 1991. 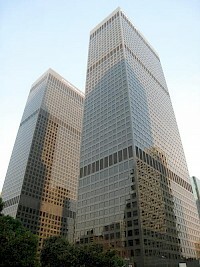 In addition the office has the Los Angeles offices of Sidley Austin. 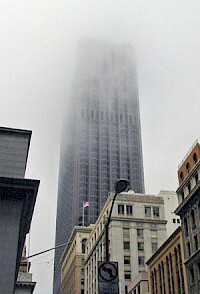 Georgia-Pacific Tower is a 697-foot (212 m) tall skyscraper in Downtown Atlanta. It contains 52 stories of office space and was finished in 1982.Before the 6 year era of tall skyscrapers to be built in Atlanta, it was Atlanta's 2nd tallest building from 1982–1987, and during that time period, the Westin Peachtree Plaza Hotel was the tallest building in Atlanta. Including the extra 6 years which were 1976-1982 before the Georgia Pacific tower opened.